In 2012, I wrote a series of posts on the literary sparks and the interpretive spins in the Hebraic-Hellene translation called “the Psalms.” From this Septuagint, we actually get this name “Psalms,” from the Greek word, Ψαλμοὶ. Quite literally, this means something like Pluckings or Strummings [as in the activity of a musician playing a stringed instrument while singing the lyrics of poetry]. 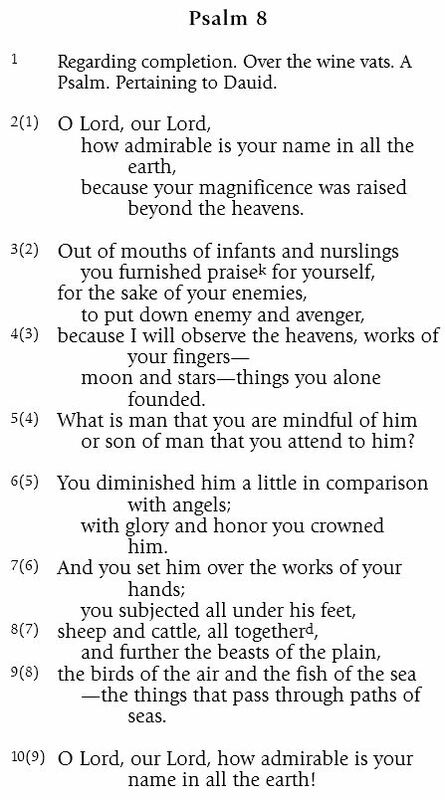 In 2013, just today, I want to write a very brief post on some of Psalm 8. I do not want to imply that there is not much to see in this Psalm or, consequently, that there must not be much to say about it. Rather, in my re-reading of it this morning, there came just a few things that sparked my attention for the first time. I recognized a few words from one of the plays of Aeschylus. This made me wonder whether the translator(s) might have been thinking of the Greek literature. Was the reader or listener being signaled to a larger or different context of some sort? Was there an attempt to place this poem in a particular genre of interpretation? We might only speculate. Let’s read the Psalm in Greek, before the New Testament context. What then do we see? Now let’s focus on what jumped out at me this morning. It was something in the third verse (which in Hebrew is the 2nd). What is there? And why? Better, no doubt, to serve this rock than be the trusted messenger [ἄγγελον, angelon] of Father Zeus! Such is the proper style for the insolent to offer insult. I think you revel in your present plight. I revel? Oh, I wish that I might see my enemies [ἐχθροὺς] revelling in this way! And you, too, I count among them. What! You blame me in some way for your calamities? In one word, I hate all the gods [τοὺς πάντας ἐχθαίρω θεούς] that received good at my hands and with ill requite me wrongfully [ἐκδίκως, out of Justice]. Your words declare you stricken with no slight madness. Mad I may be—if it is madness to loathe one’s enemies [ἐχθροὺς]. You would be unbearable if you were prosperous. “Alas”? That is a word unknown to Zeus. But ever-ageing Time teaches all things. Yes, but you at least have not yet learned to keep a sober mind. Or else I would not have addressed you, an underling. It seems you will answer nothing that the Father demands. Yes, truly, I am his debtor and I should repay favor to him. You taunt me as though, indeed, I were a child. And are you not a child and even more witless than a child if you expect to learn anything from me? There is no torment or device by which  Zeus shall induce me to utter this until these injurious fetters are loosed. So then, let his blazing lightning be hurled, and with the white wings of the snow and thunders of earthquake let him confound the reeling world. For nothing of this shall bend my will even to tell at whose hands he is fated to be hurled from his sovereignty. In several of the plays by Aeschylus, the role of the Herald (or the one bearing news like an Angel) is important. Likewise, the gods are important. The agency of mortal humans to speak and the question of whether children in a family’s hierarchy have any agency is a minor part of the lines of the play I’ve quoted above. And the Greek phrases for enemies [ἐχθροὺς] and for wrongfully [ἐκδίκως, out of Justice] are chosen both by Aeschylus’s Prometheus and by the Septuagint translators’ David. Now, before anyone too strongly objects that the LXX translator(s) couldn’t possibly have been thinking of the play(s) of Aeschylus, I’m just going to say again that very little of certainty is known yet of this Psalm, either in Hebrew or in its Hellene counterpart here. If nothing else seems obvious, then there does seem to be wordplay and poetry and literary nuggets and sparks and spins. Oh goody, another Ψαλμοὶ post! Those instructions for musical instruments (elusive or otherwise) is one of the reasons I think of the book of psalms primarily as a hymnal: being a (presently-inactive) church musician myself, that gives it great meaning for me. If the English of mine sounds a little forced, then please imagine that the Hellene representing the Hebrew sounds this way a bit too. Do you mean to say that the Greek is a bit forced? Does the Hebrew rhyme as well, or use other literary techniques to accent the same words? The connection to Aeschylus doesn’t seem very compelling to me, but reading that scrap of the play made me think of the book of Job. I wonder if there are any connections there? You’re right to see more of a connection with Job especially since both it and Promethius Bound are comprised of dialogue. The literary genres of Hebrew Tehillim and of Greek theatre don’t always necessarily go together, so how would I this late in human history hear the one’s translation as influenced by the other? Let me confess that I listen for this sort of thing; I am influenced much by Eric Havelock’s readings of Plato’s writings as the Greek scholar has his teacher, Socrates, disparaging the rhetoric of the playwrights, even Aeschylus. I just looked at what Plato writes about him in the Symposium (180a.4) and in the Republic (380a.1), the work that is Havelock’s real focus in his Preface to Plato. But I’ve also be affected by Naomi Seidman’s reading of the Talmud’s reading of the Septuagint translation as a trickster text. And Sylvie Honigman’s history of the Letter of Aristaeus and her speculation that the Hebraic translators working in the Hellene were following, not an Alexandrian (or Aristotelian or Platonic or Socratic) paradigm, but a Homeric one is a fresh, and compelling, possibility. Then there’s what Albert Pietersma asserts, but does not show, of the creator of the Greek Psalms translation from time to time exhibiting an uncanny knowledge of the Greek, with literary sparks and spins, as departures from the Hebrew and suggestions of a worldly culture of the empire. I think the empire, as much as Alexander and the Alexandrian cosmopolitans would prefer, was not canonical. There were this battle over what was good Greek. Aristotle taught his students (including Alexander), for example, to avoid ambiguities. Aeschylus hardly avoids ambiguities. How would his plays be interesting and audience influencing (almost sophistry, vs. sophistication) if there was no ambiguity. The same hold for this particular Hebrew Psalm. Yes the Semitic lyrics are difficult and are full of wordplay and of poetry, ambiguities. This particular Psalm 8 may be one of the most difficult for translators because it has so many layers of meanings and obscured meanings in the phrasings and literary allusions. The best English renderings to date are Alter’s and Nyland’s, since both translators — albeit in varied ways — are attuned to the plays of phrases and words. Well, I hope this makes some sense. Thank you again for reading and for commenting. I’m tempted to try to translate the whole of Psalm 8, but I’m very frustrated that not all of the Hebrew has come across in the Greek and would be equally annoyed at how my English couldn’t bring out more of that playful Hellene.